I've mentioned before that I haven't been all that great at setting life goals and financial goals to match them when I was younger. But now that I'm older, I've started to develop a bucket list. After making my bucket list, I've started tackling goals. No matter the urgency, I've considered fulfilling at least one item each year in order to make my list a pleasure to complete, not a chore. Some items may not require a lot of cash. Running a marathon, for example, will involve lots of time but minimal expenses — especially if I choose a race within driving distance. But others, like visiting the Arctic, will cost a lot more. Still, I figure if I start planning now, I'll be much more likely to achieve my dreams. 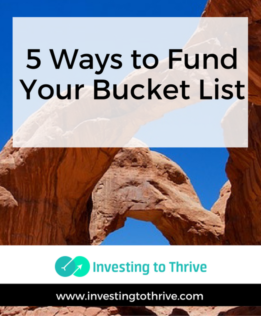 Establish and fund an investment account dedicated to the bucket list. For bucket-list items that cost several thousand dollars or more, I've considered devising a long-term plan for setting aside money for those goals. I could invest a set amount each month or put bonuses and tax returns not earmarked for my cash reserve, other large expenses, or retirement in a specially-designated account. Over time, I may be able to accumulate the money to fund specific bucket-list items or just develop a general fund to take advantage of opportunities as I identify them. For bucket-list goals that I've quantified in terms of cost and timing, I may consider setting up a goal in Betterment. I could even name the goal with my desired trip: Canoeing in the Boundary Waters or Cycling along the Blue Danube. If I change my mind about a trip or complete the bucket-list item for less money than the account's value, then I'd simply update the name of the goal and continue my pursuit of the next item. Pay installments to a trusted travel vendor. For an epic trip that I plan to make in the next 12-18 months, I've considered making payments over time directly to my travel vendor of choice. Many companies emphasize the need to a) make a deposit to reserve a trip and b) make final payments for the remaining balance. But typically I can make periodic payments to take care of my balance over time. For example, I can make monthly payments directly to a cruise line or other travel companies, such as tour operators or resorts. Earn and use travel rewards. I'm new to the travel-rewards game but I'm starting to learn how to use them to defray the costs of bucket-list trips. Through a combination of airline, hotel, and credit card reward programs, I may be able to lower travel expenses dramatically. This method generally requires significant planning, along with careful monitoring of activity associated with rewards programs. However, I have heard that the payoffs are tremendous. A couple of resources for earning and applying travel rewards are Travel Rewards Coaching by Richmond Savers and Eric Rosenberg's The Complete Beginner Guide to Travel Hacking, both free resources. Use gifts and gift-giving occasions to acquire gear needed to achieve my bucket-list goals. Many bucket-list items require significant amounts of pricey gear.For example, a backpacking trip in the wilderness may require a lightweight backpack, tent, and sleeping bag; water filtration system and cookware; and special hiking boots. Acquiring these items may cost more than the transportation to and from the destination. In some cases, I've offered my list of needed items to suggest gifts when asked what I'd like for a birthday, graduation, or Christmas present. Similarly, if friends and family members are planning family reunions, anniversary trips, or annual get-togethers, I could suggest a bucket-list destination. In this way, I can work toward my goals efficiently. Get a friend or family member to pay for the trip. The idea here is not to be manipulative so your friends foot the bill for your extravagant trip, but to simply be ready to take advantage of opportunities. For example, a few years ago, my bucket list included participating in an out-of-town mission trip. One of the best opportunities to realize this goal was to serve as a chaperone on a mission trip with the youth at my church. The youth group needed adult volunteers and had set aside money for the first three adults who committed to serving. But by the time I responded, the free slots were taken. I happily completed the trip but could have saved a few hundred dollars if I had anticipated the possibility of a free offer and responded more quickly. Similarly, I might receive an invitation from a friend that involves a free stay at a beach house, lake retreat, etc. and fits within my bucket-list agenda. When I've identified what I want to do, then I may be more likely to accept the invitation without hesitation. Putting together a bucket list is the first step in accomplishing goals. The next crucial steps are carving out the time and locating the funds (if needed) to implement bucket-list plans. How have you funded and fulfilled your bucket-list goals? Thanks for the mention in this great post! I started tracking a life list (a less morbid name for bucket list) a few years ago and have enjoyed reaching my goals. I create 1 year, 5 year, and lifetime goals and have hit nearly 100% of my goals and experiences within the time frame I set. I just got back from a huge trip to Spain last month using the exact travel hacking strategies I shared in that mega post. I hope everyone finds that money saving advice as useful as I have. You packed a ton of great information in your article on travel hacking — thanks! I’ve started exploring the basics of travel hacking and hope to use your tips in the coming year.